Bed linen should be comfortable beds the linen should have a good appearance bed linen should and with stand abrasion while on the bed and during laundering. Blankets provides warmth in bed, it is usually to provide one under blanket (bed pad) two or three top blankets for each bed. The size of blankets for each bed. The size of the blanket various tremendously. But they are generally little shorter than sheet. White of dale colored blanket are more often used in hotels. Bed sheet should be long enough to give a good tuck in and a good win over at the top of the product. The blanket and oddity from grease newspaper print the base of the bed sheet. Pillow slip will be made of the some materials as the sheet, frills and stitching are not recommended and the house wife. Flat is the most usually bottom burned and to the red slips need more attraction regarding repairs. Even with the house wife and hence so, the pillow is hidden slip should be fills, easily over the pillow. Bath towels are usually of cotton Turkish which has a looped pile on the both side, the towel are stronger. Bath sheets are frequently used while longer size. It is normally provided in private bath rooms in first class hotel. They may be linen (or) cotton in the past were always of husk a back which is a close fancy weave and best quality is very smooth and always made of linen now Turkish towel, hand towels are provided in majority hotels. Bath mats must to be very absorbent and are often made of turkey towel (or) candle wick, these are laundered frequently and so are considered more hygienic then bath mats. Table line should be good appearance and comfortable they should be durable and with stand abrasion. While on the table and during laundering. The table cloth is perhaps only a little grubby; this is not as expensive to have re-laundered as would be slip cloth. A slip cloth would be placed over it for the succeeding service this is not as expensive to have re-laundered as would be a table cloth. Size of a slip cloth: 1m X 1m (or) 3 ft X 3 ft. It is used by every waiter a protection against heat and to keep uniforms clean. Bedspread dimensions include a 20 ½” drop on sides and bottom, and a 10 ½” length for a pillow tuck. The bedspread reaches completely to the floor on three sides of the bed. Twin 39" x 75" -- Finished size: 81" x 110"
Twin XL 39" x 80" -- Finished size: 81" x 115"
Full 54" x 75" -- Finished size: 96" x 110"
Full XL 54" x 80" -- Finished size: 96" x 115"
Queen 60" x 80" -- Finished size: 102" x 115"
King 76" x 80" -- Finished size: 120" x 115"
Twin Bunk 38" x 80" -- Finished size: 60" x 110"
Comforter dimensions include a 12” drop on sides and bottom of the quilt. No extra length is added for pillows. A comforter is designed for use with a dust ruffle and pillow shams. A dust ruffle is a piece of cloth that runs along the bottom perimeter of a bed. It serves largely as a decorative piece, but can also help prevents dust from collecting beneath the bed. Dust ruffles may be used on any size bed, including on a crib. Regardless of the bed it is used on, the ruffle should match the comforter and pillowcases. In some cases, it may also be designed to match the curtains used in the bedroom. The theme used in the color and design of the dust ruffle may also be used in other areas of the room. For example, if there is a chair in the room, it may also include a piece of cloth around its bottom perimeter that matches the one used on the bed. A dust ruffle may be attached to a bed in several ways. Some use a sort of spandex inlay that allows them to be stretched out around the bed, similar to the way the corners of the bottom sheet on the bed are stretched over the corners of the mattress. Others may also simply wrap around the bed and connect with themselves at one location, though it can be difficult to obtain a tight fit with this type. Providing uniforms for hotel staff is one way of ensuring proper grooming, thereby reflecting the standard of the hotel and creating a good impression on the guest. Having an uniform and enables the guest to identify staff and their position in the organization. To the employee, it is a status symbol, creating a sense of belonging and thereby boosting employee morale. Apart from the aesthetic appeal, uniforms are frequently designed to suit the task that is carried out. Of housekeeping are inanimate, material things. It is the people who bring warmth and friendliness into these spaces and these people are the employees of the hotel. Ill-conceived, and poorly co-ordinate uniforms worn by hotel staff can create a jarring note in the entire image projected by the hotel. For Kitchen stewarding, Laundry, Horticulture and Engineering staff. Fabrics which are used by the textile industries to make apparels and other furnishing materials can be broadly divided into two categories viz., natural and synthetic. Natural fabrics are derived from animal coats, plant seeds, stems and leaves, and silkworm cocoons. The fabrics which are derived from plants are cotton, linen, jute and ramie. All these fabrics possess certain unique physical properties, for example cotton is the perfect material to make undergarments and sportswear and summer apparels as it is extremely breathable. There are some popular fabrics which are drawn from the hair, skin and other body parts of certain animals also. The most widely used protein-fiber fabrics used in clothing are silk and wool. However, synthetic fabrics like nylon, rayon and polyester are also getting equally popular these days. Understanding and identifying these fabrics can be quite a task to master. To assist you in the endeavor, here is a detailed account of most commonly used fabrics and their nature as well as their sources. Angora can be divided into two types. One is Mohair, which is derived from the Angora goat. The other is Angora Rabbit Hair which is made from the fur of Angora rabbit. Generally, Angora rabbit hair is known as Angora and the fiber derived from Angora goat is known as Mohair. The wool which is derived from the rabbits is extremely light, soft and somewhat silky in texture. It keeps your body much warmer than common wool and thus makes for fine winter wear. As a very small quantity of fiber can be drawn from angora rabbits, the angora fabrics often come blended with other fibers. This fabric is extremely expensive and is commonly referred to as the fiber of Kings. The major suppliers of cashmere fabric include China, Mongolia, Tibet, Turkey, Afghanistan, Iraq, Iran, Australia and New Zealand. These fabrics are light, soft and extremely warm. Wool is the most popular fabric in clothing and other home furnishings. Wools are light, cozy and wrinkle free. These are also highly durable and possess great elasticity. Merino wool is the finest wool which is derived from Merino sheep. Nowadays, wools are used to make a wide variety of textile products. The protein fiber of silk mainly constitutes of fibroin which is secreted from the silkworm larva. Silks are lustrous and exude white or cream color. Silk can quite easily be dyed but exposure to sunlight can make it loose the color. Cotton is one of the most commonly used fabrics in the world and is derived from the cotton plant. Cottons are extremely comfy and make for great fabric for summer apparels. Apart from apparels, cotton fibers are also used in home furnishings, medical and surgical accessories as well as in automobile décor. This plant fiber is derived from the stalks of the flax plants. Linen is the strongest fiber derived from plants. The best feature of this fabric, apart from its strength, is that is can be dyed quite easily. Fabrics made from linen are extremely comfy and posses a natural lightness and luster. However, it is very prone to wrinkles and possesses low elasticity. The jute fibre is extremely soft, yet strong. Fabrics made of jute are commonly used to make items such as bags, painting canvas, ropes, jute yarn, sacks, twine and backings for carpets. They, when mixed with other fabrics, also make for durable apparels. Ramie fiber, commonly referred to as china grass, is one of the sturdiest plant fibres. Fabric derived from Ramie fiber is white in color and has a great natural luster which makes it highly popular. It possesses high absorbing properties and its strength increases manifold particularly when it’s wet. However, it is much more prone to breakage as compared to other fabrics. It is commonly available blended with other fibers like cotton or wool. Nylon is a synthetic version of silk. This particular fabric is light, strong and extremely durable. Nylon is the sturdiest manmade fiber and is used to make a number of furnishing items apart from apparels. Polyester is one of the strongest fabrics, with low elasticity and is highly resistant to shrinkage and stretching. This fabric is highly durable and can be washed quite conveniently. This fabric can be mixed with cotton and wool and is widely used to make clothing and home furnishing items. This is facilitated through chutes, canvas bags, trolleys, collapsible wire carts, skips.. It is an essential activity when laundry services are on contract. Guest laundry may also be collected, and billing and marking undertaken, should the laundry be off-premises. 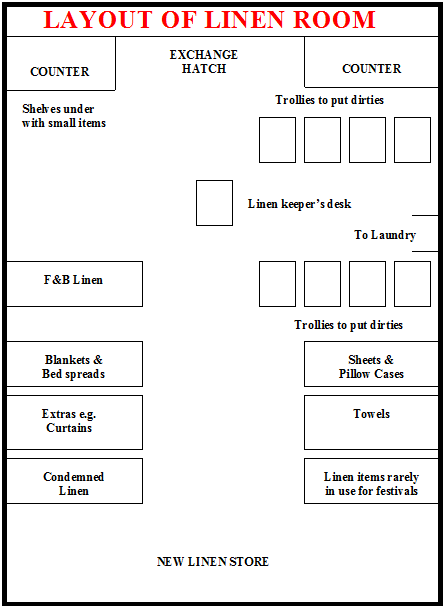 Sorting is carried out primarily to make counting possible as well as for streamlining laundry procedures. Linen is counted in order to make a record so that issuing to departments may be accurate and it is possible to tally the exchange of linen between the linen room and the laundry and a basis for billing exists. Linen is packed in canvas bags to prevent damage to the linen articles. Those articles that need mending and those, which are heavily stained, may be segregated and put into separate canvas bags. The use of colour coding in this respect is useful. This obviously refers to the off-premises laundry. The time for despatch is usually anytime between 1300 hrs and 1600 hrs so that servicing of rooms is over by then and guest laundry will have been collected. It is possible that soiled linen from the F&B outlets will also have been collected. Clean linen is delivered in the morning hours and evening deliveries are usually for guest laundry. Checking the quantity to ensure that the amount of laundered linen tallies with the amount of soiled linen articles sent. Inspection of the quality of wash i.e. stains and dirt removed, no damages, no loss of shape or colour, no blue streaks or patches from the optical brightener, properly ironed. It is also possible that articles belonging to other hotels have been inadvertently delivered, so checking for this is essential. The amount of space to be allocated for storage depends on the size and type of operation and the linen coverage, When designing the storage space for linen it is necessary to consider the type of shelves required, the method of storage as well as hygiene and safety factors. This is generally done on a clean-for-dirty basis. Some hotels use other systems of exchange such as topping up or a fixed issue based on expected occupancy. Still others may use a package system. Linen may be colour-coded for convenience. Whatever the system, it must be practical and serve the purpose of control. In some hotels specific timings are fixed for issue of linen. The name or logo of the establishment is put onto the linen item for identification. The supplier may do this or the establishment, by embroidering, printing or embossing either directly on the fabric or on labels which are attached to the linen article. In special cases, the logo/name may actually be incorporated in the weave by the manufacturer. To judge the life span of an article, the date that it was first put into circulation may also be indicated on the article. Damaged items are mended by stitching or darning. Alteration of uniforms is usual and condemned linen is converted into useful items called cut-downs/ makeovers. It is important to maintain a record of the condemned articles and the makeovers, so that they can be adjusted in the stock records. Many records are entered on a day-to-day basis for the exchange of linen between the linen room, laundry and floors/departments. Purchase records are essential and records of condemned linen and makeovers are usually maintained. Periodical stocktaking is carried out and the annual stocktaking is recorded in the stock register, thereby providing the value of linen as an asset. It is important that the access to the linen room is restricted so as to prevent misuse and pilferage. Also linen is prone to fire breakouts so precautionary measures are taken to prevent this and the linen room is strictly a non-smoking area. Usually there is a section in the linen room for this purpose. However in large organizations, where each uniform is specially designed, there is need for a separate uniform room. - adjacent to the laundry if on-premises, usually with an interconnecting window between the rooms. - near the service entrance if the laundry is off-premises. - near the service elevator for easy transportation to various units. - away from the food production area to avoid a fire hazard as well as prevent linen from absorbing food odours, smoke, soot and dampness. 5. Mobile Uniform Stand :For transporting uniforms that are hung on hangers. 6. Sewing Machines For mending of linen and uniforms. 7. Hanging Racks To hand uniforms that cannot be folded and stored. 9. Coat Brushes used for brushing dust off uniforms. 11. Linen Bags For separating linen / uniform item wise till they are given to the laundry. paper bags For packing unused linen and uniforms. Generally a hotel should have a minimum of three sets of linen. Linen Coverage is a term used to refer to the total number of sets of linen maintained by the hotel and their distribution. The number of sets of linen in the inventory is also referred to in terms of ‘par’. · Thread count - the total number of warps & wefts in 1sq. in. of gray goods fabric. The total thread count should be above 150. It is advisable to obtain samples and launder them to observe the effects of laundering before placing a purchase order. Purchasing linen of the correct size is extremely important as wrong sizes can affect appearance and even hamper operations, besides avoidable wastage and loss of money. i) Look for a firm smooth weave and strong selvedge. ii) Check for the amount of ‘dressing’ that falls out from the fabric when rubbed together. iii) Machining should be strong (10 to 15 stitches per inch). iv) Obtain samples and test for laundering effects i.e. shrinkage, loss of shape, colour, etc. v) Buy in bulk to avail of discount. vi) Stagger supply to overcome / avoid storage problems. vii) Large orders should be marked or monogrammed by the supplier. viii) Select a supplier on the same level as your organization, preferably with a reliable reference. ix) Accurate specifications must be provided when placing orders, particularly with reference to size. so that the specifications may be met with. · Indicate purchases between current and previous stocktaking. · Provide a record of condemned articles. · Act as a ready reference for ordering, also indicating the level of reserve stock. · Provide a means of judging the life span of linen article. Stocktaking is counting what you have (ACTUAL or PHYSICAL STOCK) and comparing it with what you are supposed to have (BOOK or RECORDED STOCK). It is an essential activity that must be carried out at regular intervals. Any discrepancies should be accounted for and adjusted in the records. It is an operational necessity in order to be able to predict future requirements. Stocktaking acts as a control measure by highlighting discrepancies, thereby promoting investigation. It also acts as a deterrent for pilferage and ensures rotation of stock. Departments concerned must be intimated at least one day in advance. 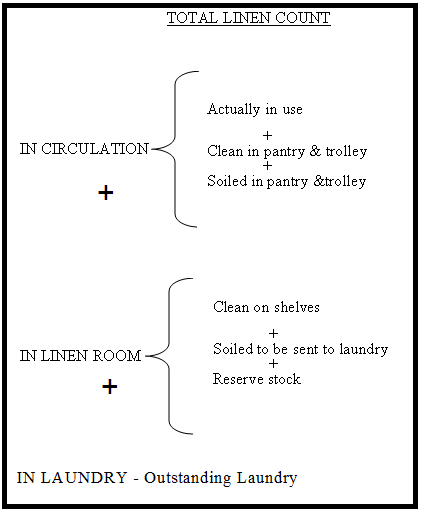 All linen must be counted on the same day or at least the similar type linen is counted at a time (Room Linen is separated from F & B Linen), so as to prevent ‘borrowing’ to make up deficiencies. A convenient time is chosen when all linen movement can be halted without causing too much of a problem to the operations. v Room linen is either directly received by the laundry or by the linen room. v In either case, the Floor Supervisor physically counts each soiled item on the floor and eaters the figures into the Room Linen contract sheet. 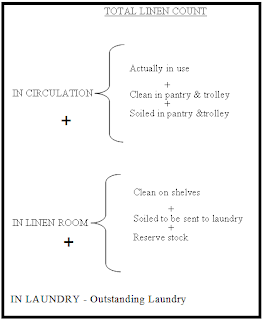 v Two copies of the room linen control sheet are sent with the hamper of soiled linen to the laundry or Linen Room. v The Laundry Supervisor or Linen Supervisor, whoever is responsible, recounts the soiled linen brought down and verifies with the Room Linen Control Sheet. The concer­ned supervisor then stamps "Received" after the tally and returns one copy while the third copy is retained by him/her. If the Laundry Supervisor is directly receiving the laundry he/she then sends the second copy to the Linen Supervisor while retaining the third copy himself. v Against the Room Linen Control Sheet the Linen Supervisor issues fresh linen on a one to one basis. 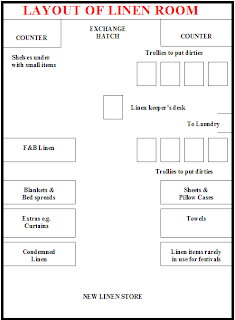 In case the Linen Room is short of fresh linen at the point of time then he/she enters the balance due on the Room Linen Control Sheet and issues the shortfall in the next lot. v The rooms must be so constructed as to eliminate the possibility of damage by insects. v The room must be well-ventilated, cool and dry. v Hot water or steam pipes should not run through the linen and uniform rooms. The rooms should also be protected against dampness, sunlight and chemical fumes. v Properly designed racks should be used so that rust and white ants do not get to the materials. The last shelf of the rack should be at least six inches above the floor. v The room should have only one entry/exit for security purposes. v The room should be so located as to be easily accessible to all employees as well as the laundry. v The room should have a counter for the exchange of linen/uniforms. v The rooms should be periodically subject to pest control schedules. v Spring cleaning record – For preventive cleaning cycle of rooms in the month. v Weekly stores list file – For record of consumption and requisitioning of cleaning / guest supplies from stores. The Housekeeping attendant of the floor and the linen room supervisor or the attendant signs this linen exchange register or the book in his absence. This book is maintained as a record of exchange in the two sections.